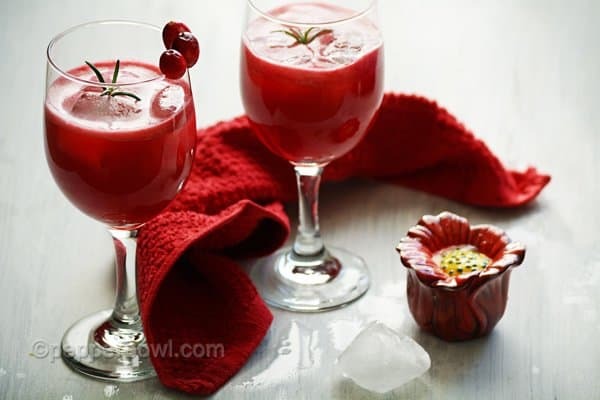 Thinking of to make you own ‘Fresh homemade cranberry juice’? Thinking to make your own zing factor for your cocktails? or Bored with same old orange juices in your breakfast table? Thinking to start your day with refreshing juice than your normal regular juice? For all your questions my answer would be this simple. make your own homemade cranberry juice. My answer would be ‘make your own homemade cranberry juice’ for all your searches like, make your own ‘Fresh homemade cranberry juice’, DIY zing factor for cocktails…Try this easy recipe to make your own. The fun factor of cranberries is that it felt like a rock in between your fingers, have huge vacuum chambers inside them. Bounce like a ball. Yeah, fresh cranberries bounce like a ball. If they do not bounce well, the cranberries in your hands are not that much fresh they are. The Cranberry Juice available in the market is loaded with tons of sugar to compensate with its tangerines. So, it ruins the idea of consuming store-bought juices for healthy reasons. Making them at home can retain their healthy facts. Sugar can be adjusted, and juice can be diluted to everyone’s choice and necessity. You may also interested in looking into other homemade juice recipes like Cantaloupe juice, watermelon lemonade, orange spritzer. 1. Wash and clean cranberries. Fresh cranberries are stiff and hard as a rock. Remove all spongy cranberries, if you have any in the pack. 2. In a large bowl, add these washed cranberries, ground cinnamon, sugar and 4 Cups of water. The sugar can be adjusted later on stages. Allow it to boil for 10 minutes, by covering the lid. By this time, cranberries should be soft as sponge. If not, allow it to boil few more minutes, until they becomes soft. Keep aside to bring it to room temperature. 3. 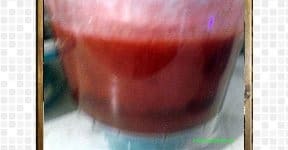 Transfer this cooled down berries mixer to the blender/mixer/juicer. Run the machine for 2 minutes or until they mashed up well. Strain the juice. The left over fiber can be turned out to cranberry sauce. 4. Add strained juice, along with ice cubes and serve Cranberry Juice Recipe. Add ice cold water or sugar, if needed. 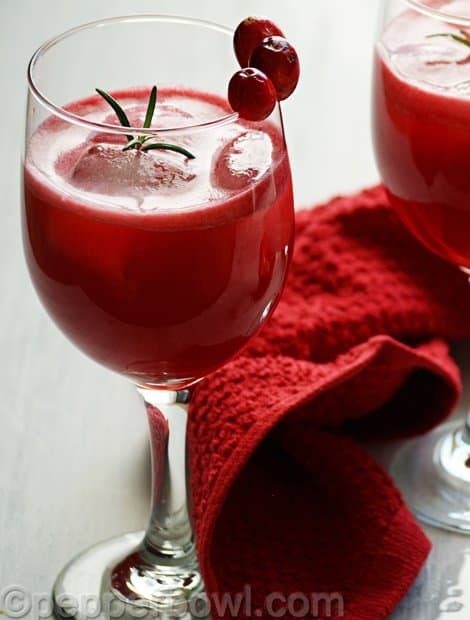 This cranberry juice is best for making cocktails and mock tails. 'Fresh homemade cranberry juice'? Thinking to make your own zing factor for your cocktails? or Bored with same old orange juices in your breakfast table? Thinking to start your day with refreshing juice than your normal regular juice? Wash and clean cranberries. Fresh cranberries are stiff and hard as a rock. Remove all spongy cranberries, if you have any in the pack. 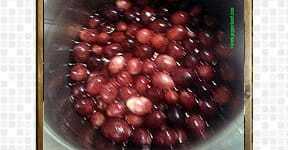 In a large bowl, add these washed cranberries, ground cinnamon, sugar and 4 Cups of water. The sugar can be adjusted later on stages. Allow it to boil for 10 minutes, by covering the lid. By this time, cranberries should be soft as sponge. If not, allow it to boil few more minutes, until they becomes soft. Keep aside to bring it to room temperature. Transfer this cooled down berries mixer to the blender/mixer/juicer. Run the machine for 2 minutes or until they mashed up well. Strain the juice. The left over fiber can be turned out to cranberry sauce. Add strained juice, along with ice cubes and serve Cranberry Juice Recipe. Add ice cold water or sugar, if needed. 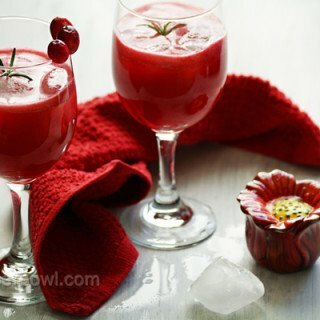 This cranberry juice is best for making cocktails and mock tails. Dilute with palin soda, can add fizz to this recipe.Do not forget to look into other interesting juice recipes like, Fresh Kiwi Juice recipes also. The clicks are wonderful and the drink is so inviting! Wish they were available here.